The last section looked installing all the required software to develop enterprise applications. In this installment, an example JEE application starts to be developed. In this installment, Java Server Faces and internationalization are introduced. The source code for this chapter can be downloaded as a zip archive from here. 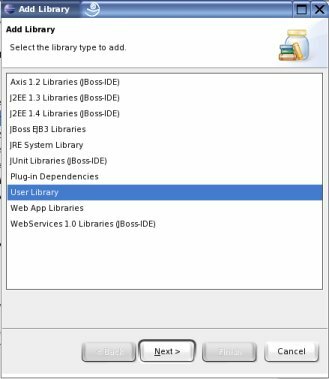 Before starting this installment, JBoss, Eclipse and the JBoss Eclipse IDE plug-in should be installed and configured correctly, as explained in the previous installments. 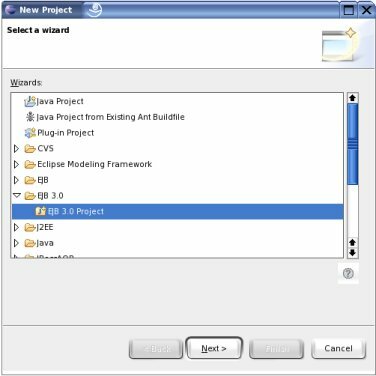 In Eclipse a new EJB 3 project is created. Next is pressed and MyCV is entered as the project name. Next is pressed, and the existing JBoss configuration is selected. 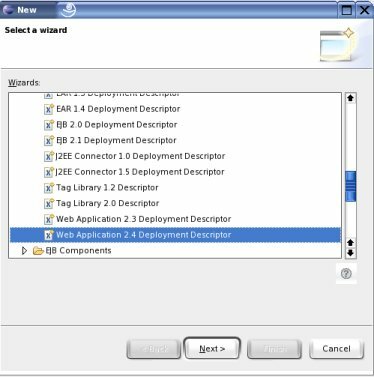 If no JBoss configuration exists, how to create a configuration is covered here. Finish is clicked, and the project is created. Add library is clicked in the above dialog. 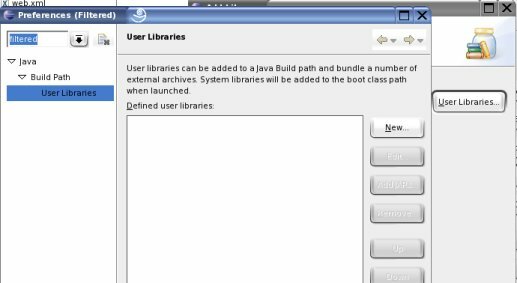 User library is selected, as this is a new "user" library that is being created. In the "User Libraries" dialog, the "New..." button is pressed. The name of the library given is JBossJSF, as it will include the jar files that JBoss includes in its installation. When the above dialog is dismissed, by clicking on OK, the "Add Jars..." button is clicked in the "User Libraries" dialog. 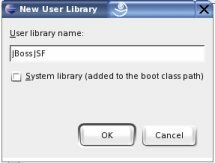 The jar files to add to this library can be found in a JBoss folder, below the root installation of JBoss called server/default/deploy/jbossweb-tomcat55.sar/jsf-libs. All the files in this folder are selected and added to the library, then OK is clicked. All the subsequent dialogs are dismissed by clicking on OK or Finish. This completes the creation of the JSF user library. The above enables JSF in the web application. In addition, the application's display name is given, and the JSF state saving method is set to "server". The STATE_SAVING_METHOD can be either "client" or "server". The client value means that the entire state is saved in a hidden field on each page page. The server value means that the state is saved on the server. For large applications, saving the state on the client may become problematic, hence saving on the server is usually the best option. When developing web applications, an error page can prove to be very valuable. The error error page, shown below, is used to display an exception message and a stack trace. It is usually displayed if there is a bug in the code, or the if system is not behaving correctly. The errors generated when the user enters incorrect values should not use the error page. Some errors generate a stack trace in Eclipse's console window (and JBoss' log file), but others do not. When creating JSF pages, it is common to mistype something or forget to include an attribute. 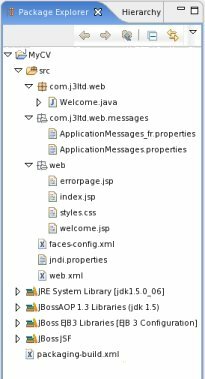 When the application is run, the JSF page in question cannot be displayed, instead the error page is displayed and the error message is usually a good indicator of what needs to be fixed in the JSF page. For these reasons, it is well worth creating the error page early on in the project. It is usually recommended to put as little code as possible in the error page, so that there is less chance of the error page generating an error. Now that the error page is done, the rest of the application can be developed. Whenever the application is accessed without specifying a page, index.jsp is accessed. This jsp is used to forward the user to the welcome page. The page above forwards to the application's welcome page. The welcome page allows the user to select a language to use, register and logon to the site. As a first step, the language selection is done. The additional steps of logon and registering are covered in a later installment. The page starts with the page directive, after this comes the JSF tag libraries, two of them. the html tag library is used to place JSF widgets on the page, the core library is independent of the rendering used (here it is html), it is usual to have both tag libraries, since every page's JSF content must be enclosed with the core tag "view". By convention, the html tags use the <h:...> prefix, the core tag library tags use the <f:...> prefix. The error page to use is defined with <%@ page errorPage="errorpage.jsp" %>. The bundle used in loadBundle contains the internationalized text to display. All the text displayed uses this bundle, as can be seen with the outputText tags. The form tag acts much like an html form, though it is worth noting that it does not specify which page to submit to. In JSF, the page navigation is placed in a configuration file, which is covered in a later section. JBoss 4.03 comes with JSF 1.1. It is worth noting that in JSF 1.2 it is possible to specify a prelude and coda for each page. This makes it possible to place the tag libraries, error page, bundle and <f:view> in the prelude file, and the closing tags in the coda template file. Thus the repetition of this information is no longer required in each page. It is usual for every JSF page to have a managed bean class associated with it. The managed bean class (written in Java) contains the code that the pages use to display computed values or to perform some programming logic. The idea of using JSF is that the JSF page does not contain code, only display information. In this application, the managed bean for the welcome page is used to change the locale (language used to display welcome.jsp and all future pages). When the user clicks on a language hyperlink (commandButton tag) in the welcom.jsp page, this managed bean's onChooseLocale() method is invoked. The method gets the "id" of the commandLink, which is either "french" or "english". This "id" value is used to look up the locale to set in the "locales" HashMap. The reason for using a HashMap is that additional languages can be added easily to the class, just by editing the constructor. The easiest method of storing the text to be displayed is to use properties files. It is also possible to use java classes, but this is not done here. In this example, english and french are supported, the default language is english. The english text is placed in a file within the src folder path as follows: src/com.j3ltd/web/messages/ApplicationMessages.properties. 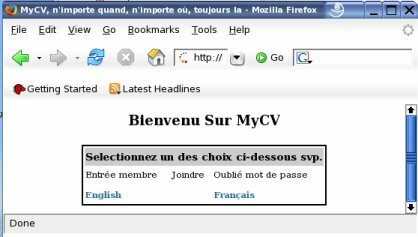 The french version of the text is placed in src/com.j3ltd/web/messages/ApplicationMessages_fr.properties. Java's internationalization framework works out which file to use depending on the language. The file extensions _en for english, _fr for french, _de for german and others are defined as part of Java's internationalization, see http://java.sun.com/docs/books/tutorial/i18n/index.html	for more details about internationalization. In the next section, english is configured as the default language to use, so it is not necessary to append "_en" to the filename. welcomeBoxTitle=Selectionnez un des choix ci-dessous svp. Managed bean names, and the java classes they use. Navigation rules, which specify which page to display following a given action. Many other things are also present in this file, each one is explained as the need arises. The internationalization details are given: the message files' location, the default locale (english) and the other locales supported (french). The managed bean for the welcome page is defined, this bean contains the code that changes the user's locale, depending on the commandLink that is clicked. The navigation rule states the welcome.jsp navigates to welcome.jsp when the outcome is "chooseLocale". The outcome chooseLocale was hard coded in the welcome.jsp page. At this point all the code needed to display the welcome page is present. Also the code to change the language in which the page is displayed is present in the managed bean. This is a good point to build and test what has been written so far. 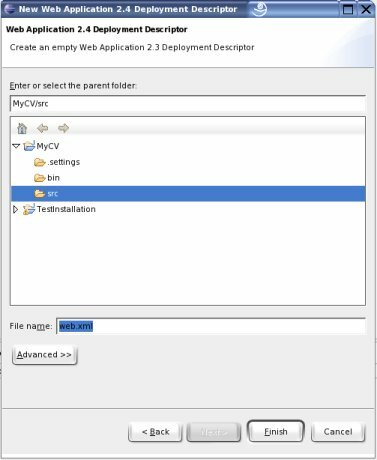 MyCV.war is right clicked and "Add Folder" is selected, the "Project Folder" bin is added. **/*.class is entered in the "includes" field to include all the java classes in the bin folder. These classes are to be archived in the WEB-INF/classes folder, the prefix textfield is used to specify this. 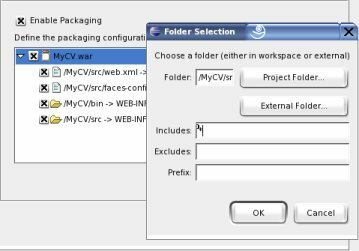 MyCV.war is right clicked and "Add Folder" is selected, the "Project Folder" src is added. 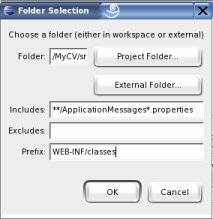 **/*.ApplicationMessages*.properties is entered in the "includes" field to include all the internationalization message files in the src folder. These files are to be archived in the WEB-INF/classes folder. 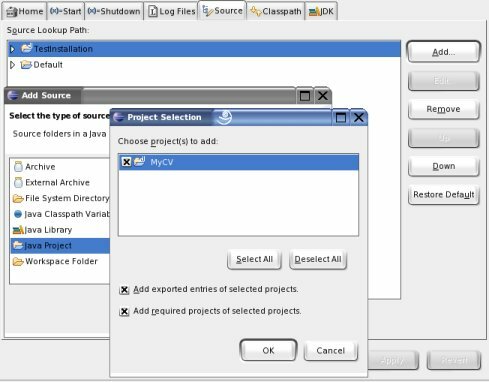 Al the project properties dialogs are dismissed by clicking on OK, or Finish. 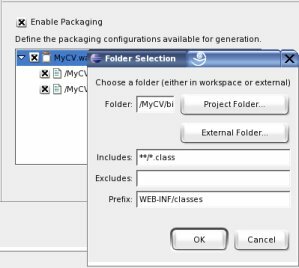 In the package explorer, the project MyCV is right clicked and "Run Packaging" is selected to build the war archive file. 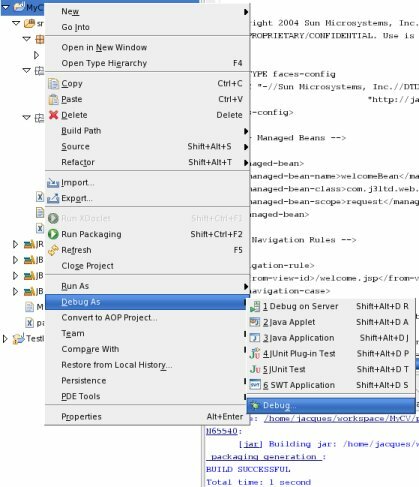 This should bring up the debug dialog, with the settings already given during the installation of JBoss (see The section regarding Testing the installation for details). OK is pressed, in both dialogs to return to the debug dialog, where "Apply" is pressed. 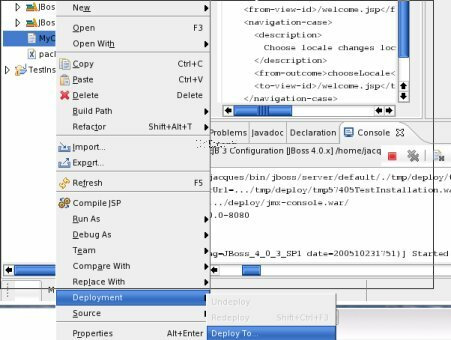 The deployment dialog should show the JBoss configuration already defined in the "Test Installation" chapter. 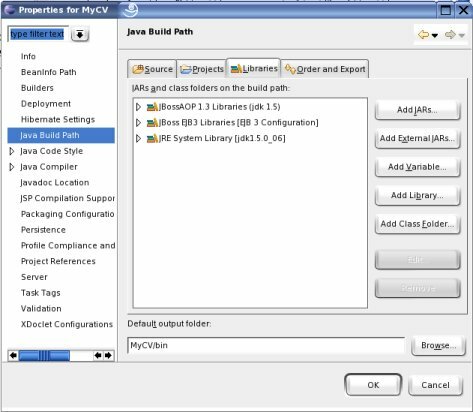 JSF, as supplied with JBoss is configured, and an Eclipse library has been created for JSF. Internationalization is implemented and working. An error page has been implemented. A JSF page and managed bean have been created, configured and tested (the welcome page). 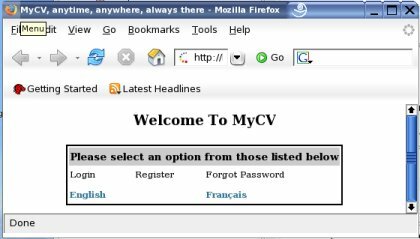 The next step is to implement the registration process, so that a user can become a member of MyCV.